The book describes analytical methods (based primarily on classical modal synthesis), the Finite Element Method (FEM), Boundary Element Method (BEM), Statistical Energy Analysis (SEA), Energy Finite Element Analysis (EFEA), Hybrid Methods (FEM-SEA and Transfer Path Analysis), and Wave-Based Methods. The book also includes procedures for designing noise and vibration control treatments, optimizing structures for reduced vibration and noise, and estimating the uncertainties in analysis results. Written by several well-known authors, each chapter includes theoretical formulations, along with practical applications to actual structural-acoustic systems. 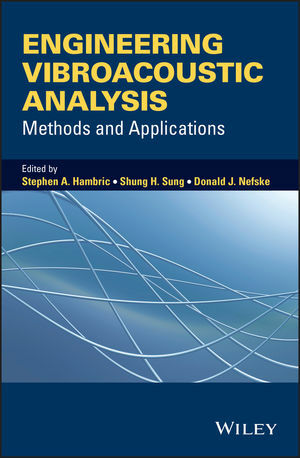 Readers will learn how to use vibroacoustic analysis methods in product design and development; how to perform transient, frequency (deterministic and random), and statistical vibroacoustic analyses; and how to choose appropriate structural and acoustic computational methods for their applications. The book can be used as a general reference for practicing engineers, or as a text for a technical short course or graduate course. Dr. Stephen A. Hambric is a Senior Scientist at the Applied Research Lab at Penn State, a Professor in the Graduate Program in Acoustics, and Associate Director of Penn State's Center for Acoustics and Vibration (CAV). He is a fellow of the American Society of Mechanical Engineers (ASME), and the Institute for Noise Control Engineering (INCE). Dr. Shung H. (Sue) Sung is a retired Staff Research Engineer from General Motors Research & Development Center. She received her Ph.D. in Aeronautical and Astronautical Engineering from Purdue University. She is an ASME Fellow, holds several patents, and is actively involved in organizing ASME technical sessions. Dr. Donald J. Nefske is a retired Technical Fellow from General Motors Research & Development Center. He received his Ph.D. in Engineering Mechanics from the University of Michigan, and has over 35 years experience in developing CAE capabilities for automotive vehicle noise and vibration. He is an ASME Fellow and currently consults on CAE structural-acoustic applications.